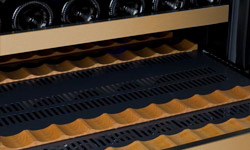 These remarkable multi-zone wine refrigerators from Allavino's new FlexCount Series give you three distinct, separately operated temperature zones for easy storage of up to 349 wine bottles. Thanks to the innovative new FlexCount Series shelving design, you can quickly access any bottle in your collection on durable metal shelves that glide out smoothly on roller assemblies. 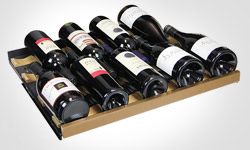 These shelves have wood slats that cradle your bottles to prevent agitation caused by movement and vibration, and are strong enough to resist sagging over time. The 3Z-VSWR7772-SST features 22 shelves that can hold up to 11 bottles each, 4 shelves that can hold up to 20 bottles each, and 1 shelf that can hold up to 27 bottles for a maximum bottle capacity of 349 bottles. The maximum capacity can be reached with many different bottle sizes and is only affected when adding in larger Pinot or Champagne bottles. Store both red and white wines with this dual zone unit, which features a digital display with easy-to-use push button controls that allow you to easily adjust each zone's temperature. Saves you money each month! Please Note: The handles are not attached to the unit during shipping, and will need to be installed when the unit arrives. The zones may be on opposite sides depending on what models are in stock when you place your order. If you need a specific configuration, please call to place your order. New Leaf ServicePRO 1-year warranty is $149.00. New Leaf ServicePRO 3-year warranty is $289.00.